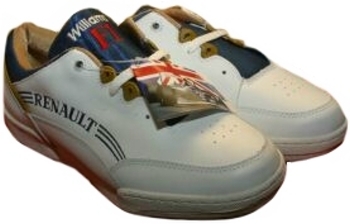 Original Williams Renault Rothmans Team Sneakers. HIGHLY exclusive, these are original team sneakers that were made for the members of the Williams F1 Renault Rothmans team in the Damon Hill era. These sneaker were never available to the general public! The shoes come with embroidered Renault logo on the sides, Williams F1 logo embroidered on the heel and tongue + the inner sole has been Williams branded. New-old-stock and still packaged in their original, fully Williams F1 branded, boxes.